What if you could save all that money and get current users to bring in the next round of customers for you? Virality isn’t just a user acquisition lottery ticket that happens to the lucky few. It’s something you can plan for, test, and build into your product. Done right, viral loop marketing can generate exponential growth for your app. But how do they work to make your app go viral? Viral loops flip the traditional marketing funnel on its head. Instead of casting a wide net and nurturing potential users to download and purchase, you tap your current users to share your app with their widespread network of friends and contacts. Essentially, viral loops get your users to advertise your app for you. They discover and install your app, fall in love with it, and share it with others. It works as a loop because each new user ideally follows the process to invite a new set of users, and on and on. If one current user invites two new users, who themselves go on to invite two new users each, you end up with a recipe for truly viral growth. There’s no 100% guaranteed viral growth formula. You’ll have to discover what will work for your unique app. The first question you’ll need to answer: are viral loops a good strategy for growing your app? The next question you’ll need to answer is which type of viral loop makes the most sense for your app. Quizzes, high scores, personal bests, custom avatars, achievements or badges, etc. This approach not only spreads the word about your app, but it lets potential users see its value immediately and provides powerful social proof. Buzzfeed is notorious for this: potential new users see user-generated content on social media from friends and want to see their own results. Both sharer and referrer are given a discount or other incentive, like unlocked features or content. 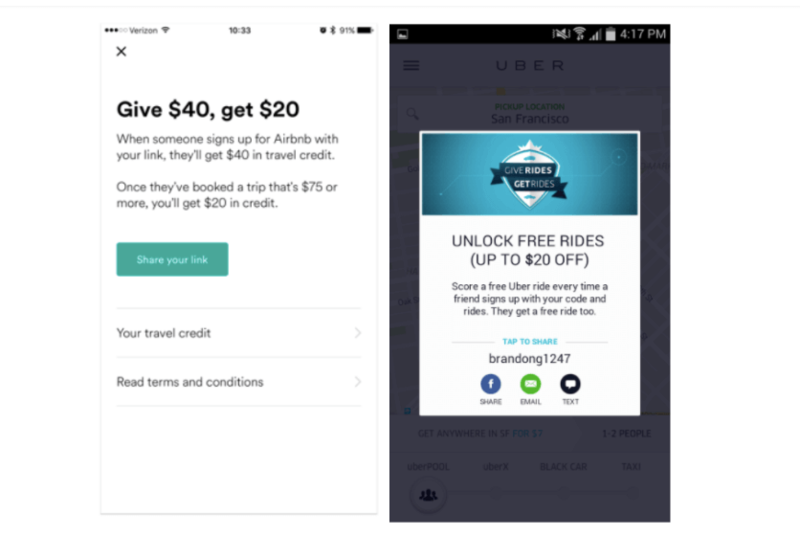 Airbnb and Uber have both used this referral scheme to great success: personalized referral codes and mutual incentives function as a viral loop to both boost engagement for current users and acquire new users. Scarcity is a powerful motivator. 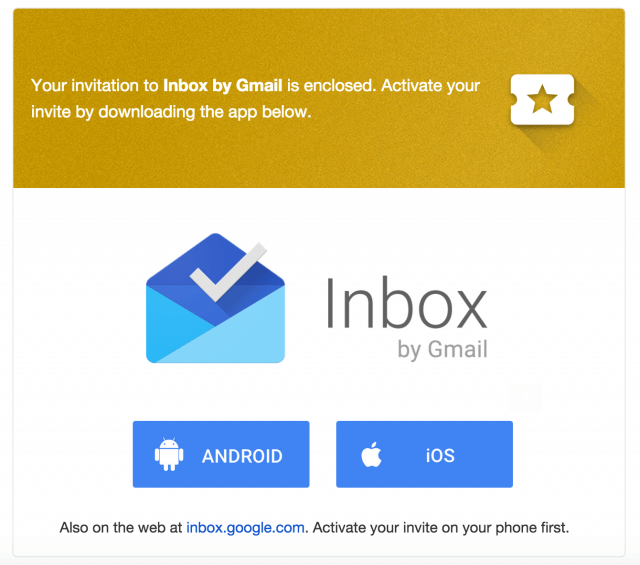 Google did this with Inbox, sharing a limited amount of invites for the initial launch. Invites create a sense of exclusivity and excitement — people have to ask friends for an in, so it gets people interested and talking about the app. And it makes current users feel powerful: they’re the cool early adopters that have something other people want. 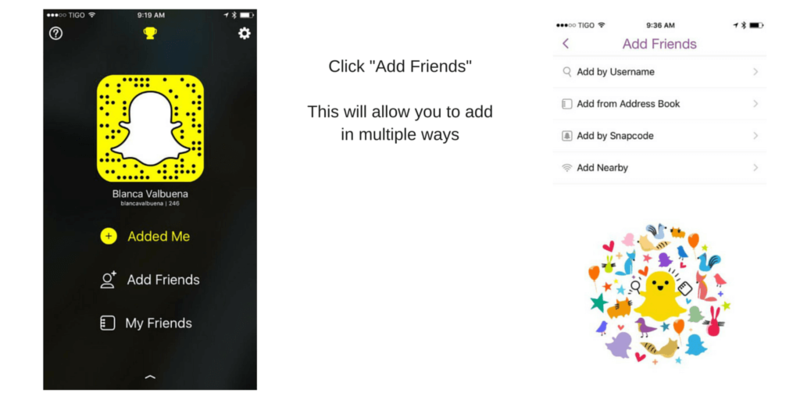 Adding friends makes the app more valuable or enjoyable. Think Snapchat: the more friends you invite, the more fun you’ll have with the app. Users end up getting more value out of the app by sharing with their networks — the more friends they sign up, the more they get. 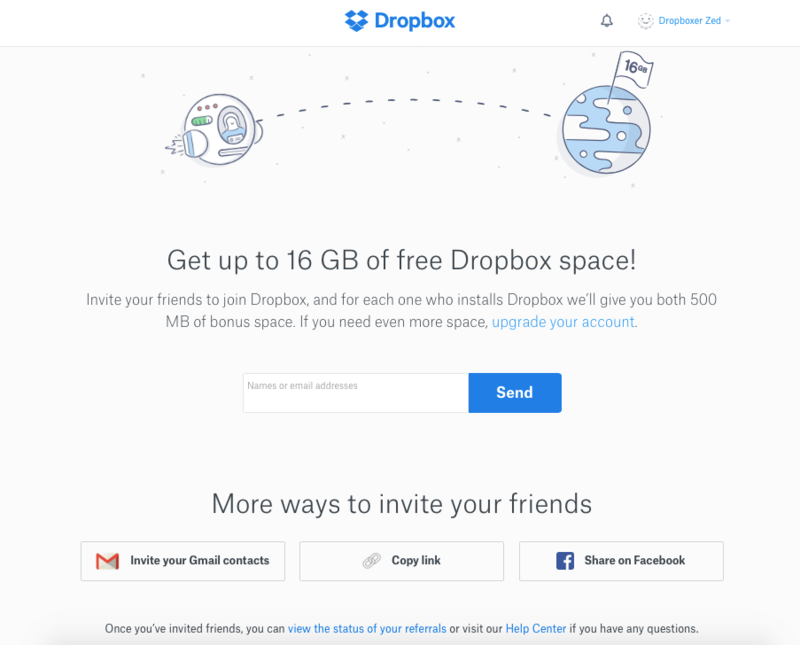 Perhaps the most famous example is Dropbox: users invite friends to earn (and give) more free storage space. This is especially effective for gaming apps, where connecting contacts or getting friends to play can actually help you progress in the game. Candy Crush used Facebook to allow players to ask friends for extra moves or lives, and invite friends to play for game boosters. At the end of the day, your success will come down to the quality of your product or service. People simply won’t share something they don’t enjoy or find valuable, no matter the incentive. What are your users motivated by: Monetary savings? Free products? VIP status? Early access to new or exclusive content? How much can you afford to put into an incentive and still make a profit? What kinds of incentives offer value to both the referrer and the receiver? 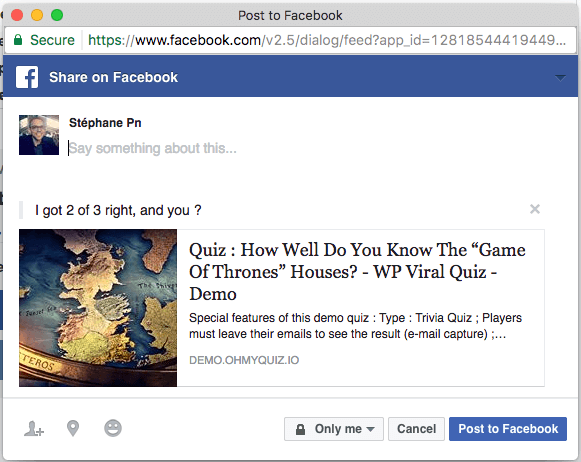 Which referral scheme will help you acquire the right users? You want sustainable growth, not a temporary spike. Step 3: What’s your onramp? How will people enter your viral loop? Pick something personal — high scores, personal bests, custom playlists, etc. People want to share and participate in things that help them express themselves. Keep your invitation and acceptance processes as short as possible to minimize drop-offs. And use funnel analysis to test and optimize for drop-offs at each point. Since viral growth is compounding, the difference between an 80% drop-off and a 75% drop-off can mean hundreds or thousands of users over time. Insert values for N, P1, and P2 based on your app’s analytics. Multiply them together to get your VC value. This will tell you how effectively your loop will grow. If VC = more than 1, growth will increase exponentially. If VC = less than 1, you’ll need to monitor and update your viral content and strategy to keep growing. If VC = 0, you won’t see any growth with this approach. If your VC is less than 1, look closer at each variable. Is your P1 value low? Or if P1 is very high, what can you do to improve N or P2? Raise or lower each value to see how it affects your viral coefficient and see where you should focus your efforts for maximum effect. Don’t trick people into inviting friends or blasting their social networks. Growth can’t come at the expense of eroding users’ trust in your brand. For example: don’t use “invite” lists that automatically select every contact in a user’s address book, making it easy to spam hundreds of people. Nir Eyal calls this a “viral oops”.6 And it’s not only detrimental to the user. It’s important for you to know who is sharing your app and why. Accidental shares can misinform and mislead your growth strategy. At the end of the day, acquisition means nothing without retention. Your focus should always be on real, sustainable growth and engagement strategies that offer users value. Put all of your efforts into providing an experience that makes users want to keep opening your app and sharing it with their friends. 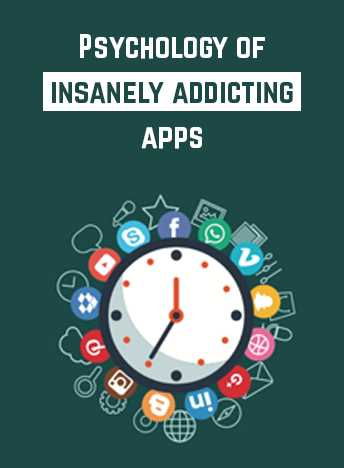 Uncover the powerful psychological tricks used by today’s most addictive apps.